The January Forum: What are your teaching goals for 2011? Last month’s discussion forum brought out some great comments from you all! Most of you agreed that the teacher should play something on student recitals when possible, as long as the piece is not overly showy. Do you have any teaching goals for 2011? What changes or improvements would you like to make in your studio this year? What other goals do you have for yourself or your students? Improve the studio business end-0f-things. Focus more on functional skills. Incorporate more interactive games/activities in the lesson. Tailor lessons to individual students more. I hope this post finds you all well and enjoying this blessed season with your family and friends. I’ve been enjoying some time off from both school and blogging in order to visit and spend time with my family. I hope you’ve missed me while I was away. =) Although the blogger inside me has been taking a break, I can assure you that the piano teacher inside me has not taken a break! I have several projects underway that I can’t wait to share in the coming weeks/months. Next month brings the beginning of my final semester of my master’s degree, which is certainly bittersweet for me. My husband and I do not yet know what the post-graduation months will bring, but I’m sure posts about our adventures will be forthcoming eventually. Next month also brings my master’s solo piano recital, which will likely occupy much of my time and attention. My postings might again become sparse for a few weeks during January, so I hope you’ll forgive me! As I contemplate the last year and look forward to the next, I can’t help but think of all of you, readers and supporters of Color In My Piano. The past year has seen a huge increase of visiters, followers, and commenters. This month even brought a few generous donations via paypal. Your support keeps me inspired and motivated to continue creating and posting! So thank you! I truly believe that through collaborations such as this, we not only help and encourage one another as piano teachers, but we also help bring integrity to our profession and calling. I look forward to another wonderful year with all my internet friends. After posting about the sheet music ornament star last week, I was inspired to dig around the web for other music-related crafts! There are tons of ways to recycle old sheet music (which you can often find at thrift stores, garage sales, auctions, and antique stores). Here’s a sampling of what I found! All links lead back to the original bloggers’/crafters’ websites. Click the photos to view them larger. 1. Sheet Music Garland | This fun garland is fast and easy, made by cutting out sheet music circles and sewing them together. It’s perfect for decorating a music room, fireplace mantel, or Christmas tree. 2. 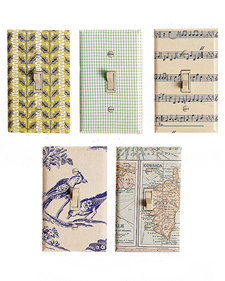 Sheet Music Light Switch Plates | Cover your plain light switch plates with sheet music to give the room a little zing! 3. Advent Calendar Cones | These sheet music cones can be used to stash Advent calendar goodies. 4. 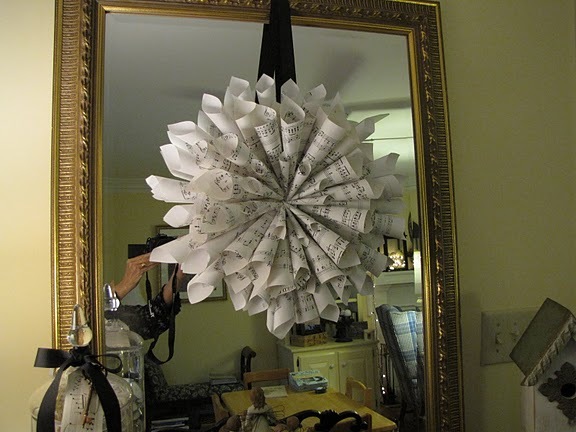 Sheet Music Wreath | Hang this beauty on your door or above your piano. Another example is shown here. Also try mini ornament wreaths like the one as shown on this blog. Looking to spice up your studio documents? Check out the fun music fonts! 1. LD Music | This charming font features hints of musical-symbol-likeness. This font would be perfect for studio newsletters, recital programs, and other studio handouts! 2. Simple Melody | Shows up as the font “New” once installed. For some reason, the spaces in this font are huge. Reduce the size of the spaces to a smaller font size and it will look normal. 3. All That Jazz | A fun piano keys font! There is no difference between uppercase and lowercase letters in this font. 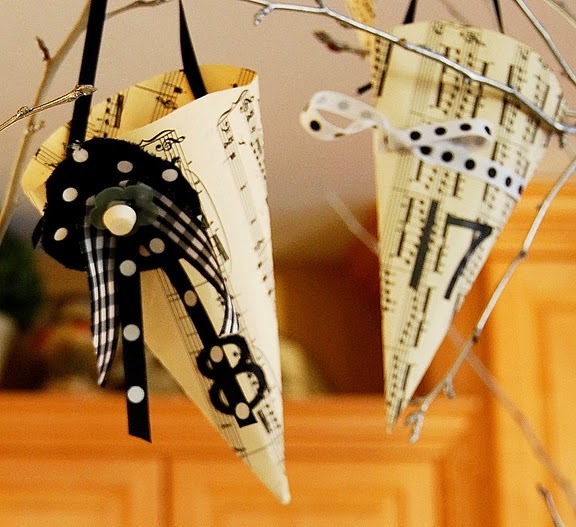 Someone on the “piano-teachers” Yahoo group forum brought this to my attention – the Better Homes and Gardens magazine’s website has instructions for a craft for making a sheet music Christmas ornament (picture on right). 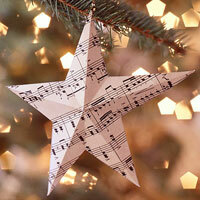 It looks like a wonderful way to make your Christmas tree a little more musical! The star pattern allows you to choose from three different sized stars. 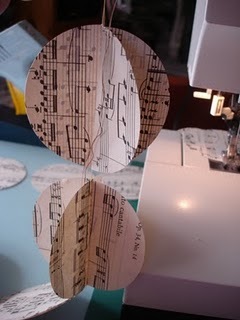 The instructions for making this ornament suggest photocopying sheet music, which of course is not legal. I would instead suggest visiting imslp.org and printing off some sheet music that is in the public domain (or use some Christmas music linked to in this post). On the pattern, the solid lines indicate “mountain folds” (fold comes out toward you) and the dashed lines indicated “valley folds.” Once the folding is complete, punch a small hole and tie a small loop using gold thread to complete the ornament. Click here to view the full instructions on the Better Homes and Gardens website. It’s been a few weeks since I’ve added a new printable to the Printables page….so here’s one I created a couple of months ago. You can find it on the Printables > Other Resources page. I created this printable with my intermediate/advanced students in mind who are working on 2- and 4- octave scales/arpeggios and have trouble keeping all their fingerings straight in their head once they start getting them under their fingers. It’s nice to have a guide tucked inside the front cover of a book to refer to now and then! Page 1: Rules and tricks for remembering scale and arpeggio fingerings (as shown on the right). 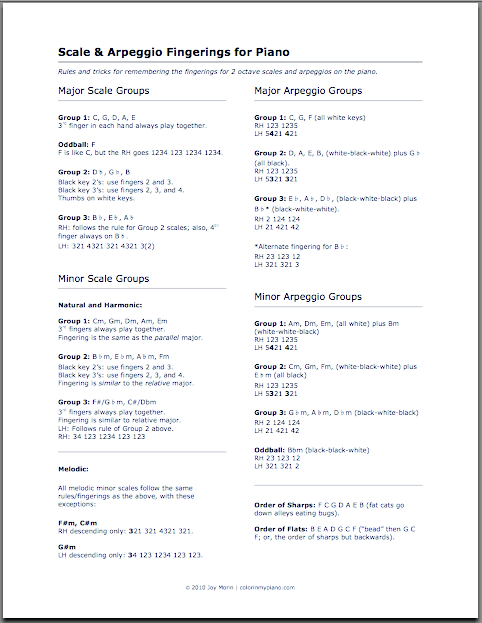 Page 2: A listing of the fingerings for each Major and Harmonic Minor scale/arpeggio (2-octave) for piano. Page 3: A continuation of page 2. Of course, there are a few different ways to finger scales and arpeggios, so I’m sorry if the fingerings listed in this printable do not correspond with the ones you prefer to teach your students. These are the ones I like to use, and I thought I’d share it with anyone who might happen to find it useful. I did my best to proof-read the fingerings, but it is certainly possible that I may have missed something….so if you encounter something that seems sketchy, please let me know! 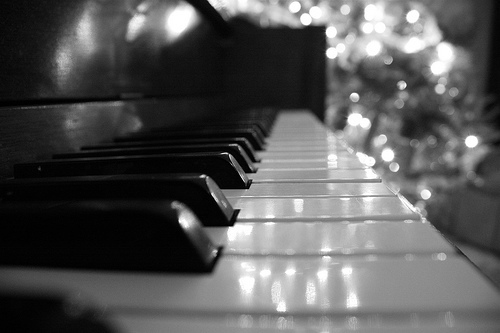 The December Forum: Should the Teacher Perform at Studio Recitals? At studio recitals, should the teacher perform a piece? Will it inspire students and will families enjoy hearing the teacher play? Or will the students/families get the impression that the teacher is showing off and blowing the students’ performances out of the water? What is your take on this issue? Please take a moment to share your thoughts in the comments below!